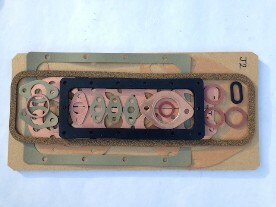 Vintage MG Parts now offer their own MMM engine gaskets either in sets, or individual gaskets and with this latest commissioned tooling is owned by VMGP. To answer any questions as to why we embarked on this project, we decided to specifically address MMM gasket profile issues, i.e. profiles with overhangs, undercuts, stud hole sizes and also look at the gasket materials being used, seeking to improve on operating performances where appropriate. Therefore, when choosing MMM gaskets it now involves material specification, profiles and pricing. 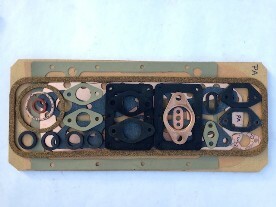 Vintage MG Parts are currently tooled up to offer complete J Type, PA and PB engine gasket sets or, individual gaskets. The J and P Type gasket sets have many common gasket components also used on the M, D, F, J4, L, K and N Type. Very shortly we hope to finish the tooling to produce the remaining 6 cylinder gaskets to be able to offer complete sets for all models. A note on cylinder head gaskets - Vintage MG Parts steer clear of association with copper and asbestos substitute composite cylinder head gaskets which have given rise to a high rate of failure on pre war cars which are not just confined to prewar MGs. These problems seem to have arisen following a switch over to asbestos substitute infil material. We only offer our own Vintage MG Parts Solid Copper Cylinder Head gaskets and having sold literally hundreds of these, we continue to maintain 100% customer satisfaction, also leading the way in low UK pricing.